This recipe for creamy garlic chicken is truly simple and can cooked in one pot. It takes just a few ingredients to get dinner for the family because it’s loaded with protein and vegetables. 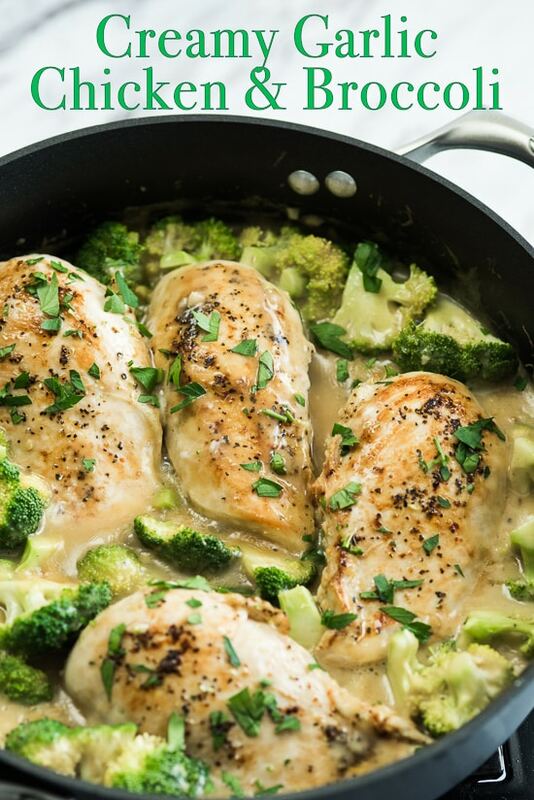 The healthy broccoli adds a wonderful crunch and vegetable to this garlic chicken. Other vegetable options you can add to this chicken recipe is spinach, potatoes, squash and zucchini. The vegetable possibilities are endless and so are the starches that you can serve with the creamy garlic sauce. Rice and pasta are always the go-to starches, but you can also try quinoa, couscous and wild rice. Crusty bread is also another great option to dip into the sauce and soak it all up. You can make the vegetables as soft or crunchy as you like for this creamy garlic chicken. If you want the vegetables softer with this creamy garlic chicken, add it when you add the chicken back into the pot. If you want more al-dente vegetables, then add it in later and time it so that it cooks to your preferred texture after the chicken is finished. Hope you enjoy this creamy garlic sauce. It’s divine! 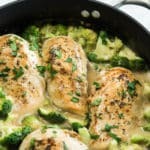 This is the creamy garlic sauce that can be used for so many dishes outside of this skillet chicken with broccoli. Our recipe for creamy garlic sauce is below and it really only takes a few ingredients to have a pot of sauce that is perfect for pasta, rice and other proteins. Instead of using fresh garlic, you can use garlic powder or granulated garlic for an extra concentrated flavor of garlic. Hope you enjoy this creamy garlic chicken for your family! 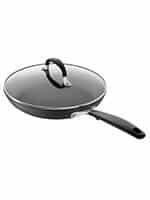 OXO non stick w/ lid – Repeated rates as one of the top non-stick pans. Browns nicely for a non-stick. 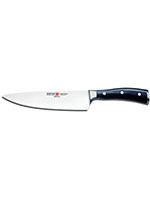 Wusthof Ikon Chef Knife – Our most used and loved knife in the kitchen. 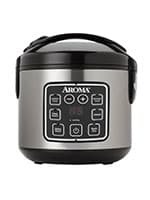 Aroma Rice Cooker. It’s so nice to have a rice cooker in the kitchen. Fill it, start it, and forget about it. Here’s a great roast chicken recipe with Sriracha, more Chicken recipes and healthy recipes . We used chicken breast for the recipe, but it can easily be made with chicken thighs or legs. If you like more sauce, add an extra can of condensed cream of chicken soup and additional 3/4 cup of water. You'll have double the sauce! Make sure to season more with salt and pepper. What could be used instead of consended soup? For someone who has to eat gluten free. I have made this a few times using one full can of coconut milk plus the cream from another (put the can of coconut milk in the fridge over night, pour off the thinner layer of milk and reserve for another use, add the remaining cream to the recipe) and chicken buillon in place of the canned soup and water. It comes out great, and does not taste like coconut. Very easy to adapt to Paleo and dairy free. This was fantastic. I will make again. Thanks Sherry for letting us know. We’re so happy you enjoyed the recipe! Mary Lou, I find Gluten Free cream of chicken soup at Publix, sometimes Super Target and the health food stores. Our favorite brand is Pacific. Substitute Chicken stock for the condensed soup. I’m too lazy to go to the store just for one can of soup. It was the only ingredient I was missing and this meal without the soup, still tasted great. Gave it a rich chicken-flavor. Great idea using chicken stock instead of this sodium heavy soup. Maybe stir in a little yogurt for the creamy part. I’m making it tonight. I made this tonight but since hubby doesn’t like broccoli I substituted canned green beans! It was very tasty! This was SUPER DELICIOUS!! Easy to make and even the kiddos ate it up! Hubby said this is a keeper!! I wasn’t expecting great things from this recipe…I just wanted something quick and easy that included ingredients I already had on hand. But let me tell ya, it was DELICIOUS! I made it exactly according to the recipe. My 11 year old son is super picky, and getting him to eat is a nightmare, but he really enjoyed this. This is definitely going into our regular dinner rotation. Thanks for sharing this!! Can you do this in the crackpot? We haven’t tried it in a crackpot or a crockpot yet. If you do, please let us know how it turned out for you. Thanks! I totally varied from the recipe! Used Cream of Garlic Mushroom soup, fresh garlic, fresh spinach. Was delicious! Love that you changed it up a bit and it still turned out great! Thanks for the readership. I have made lots of Pinterest meals, but this was thee biggest hit for my kids that we have all enjoyed!! Oh and we had it over white rice yum! That’s great news Maria. So glad your kids enjoyed it. I made this and it turned out really good. My husband loved it. Great recipe. Needed something quick and easy. This fit the bill perfectly! I also subbed cc with cream of mushroom as it’s what I had on hand. Added a dash of onion powder to the mix as well. Used half water/half milk to thin the soup but keep the creamy consistency. I would really like to try using chick stock & yogurt next time. Or purchase a low sodium can of condensed soup. Lastly, topped with a tad of cheddar cheese! Definitely will make again. Thanks! Has anyone ever tried shrimp instead of chicken? My son and I have cooked this recipe before and we both loved it! Just wanted to try something new for tonight. Super easy to make. I have a fussy child and she ate 2 helpings, so this dish is a winner. Does anyone have the nutrients though? This was a delicious dinner! I don’t usually use cream of soups, but I didn’t add any extra salt, the dish was perfect and creamy. I served with egg noodles and homemade bread! Made this tonight and two men literally inhaled this meal. It was Delicious. Definitely making again. That’s awesome that they enjoy it so much. Thanks for sharing! Made this tonight. The only change I made was to use chicken broth instead of plain water. It was really good, easy , and quick. Served it with mashed potatoes. Will definitely make this again. Hi Toni, we’re thrilled you enjoyed it and will be making it again! Love that you served it with mashed potatoes. YUM. Can this be made in the oven instead or crock pot ? Hi Denise, we haven’t tried it yet in the oven or crock pot, but hopefully one of our readers has and will let us know of their results. If we ever test it in the oven or slow cooker, we will mention the results in the recipe. That should work just fine. The frozen broccoli might end up a bit softer in the end, but should still be tasty! I just made this in the crockpot with the chicken on the bottom and the broccoli layered on top and the sauce poured over it. I put it on low for 8 hours and it was delicious. I have also used chicken broth, a bit of half and half and some corn starch to thicken instead of the canned soup and it was great! A household favorite. I make this several times a month. This recipe will be around for awhile. Thanks! Delicious. Very easy to make, Everyone love it. I would do it again for friends and family. Thanks for sharing. ? Thanks for letting us know Alma! Glad you’re sharing this delicious recipe with your friends and family! This recipe is so easy and delicious! I featured it on my blog – Lisa Living Life.com. I hope you will check it out! I made this tonight. I sliced the chicken before cooking and served over rice. Hubby said it was a “keeper”. Made enough for the 2 of us and leftovers for tomorrow night. Hi Kathleen, so glad you and Hubby enjoyed it and it’s a “keeper”! Hi, Can you use frozen broccoli in this? My family loves this recipe! Only change would be to double the sauce…you can never have too much!!!! ?. Love how simple and quick it is to make! Awesome! So glad everyone loves it. So true too, you can never have too much sauce! I love an easy dinner like this. So much flavor and it comes together so easily. Yup, there’s lots of flavor and it’s truly easy! My family loved this! Thanks so much for an awesome recipe! Hi Kay, we love spinach too! Great addition. This looks sooooo good! 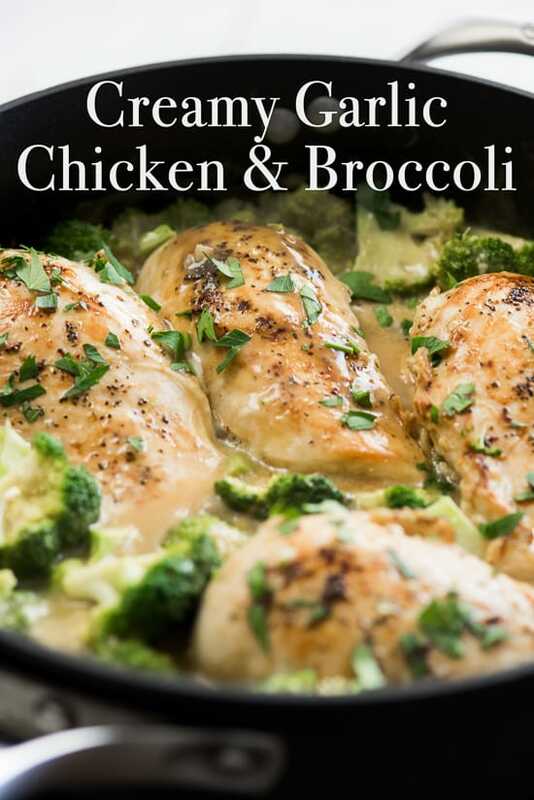 I love chicken and broccoli together in a dish! I think this will be a hit with my family! Can chicken and broccoli be frozen. If so how can long and what temperature to reheated ? Hi Pam, we’ve never tried it frozen before. It should be thawed so the chicken can cook all the way through. If you try it frozen, let us know how it turned out! This is a very easy yet, delicious dish. You bet. Should make it even better! Enjoy! Yes, that would be extra delicious because the flavor of bone-in chicken thighs are fantastic. Can’t believe how simple and satisfying this recipe is! Hit the spot and the kids loved the chicken! So glad the kiddos loved the recipe! Anytime they can eat broccoli and chicken, it’s a good thing. This recipe looks delicious – I can’t wait to try it!